Samsung has a lot to do in the field of entry-level smartphone technology, with Chinese competition hardly decreasing. The Samsung J6 still has some advantages to offer. As always with the Korean brand, there's not much to say about the finishes: the Galaxy J6 seems solid, remains elegant despite a front façade that would have benefited from slightly less pronounced edges. The general ergonomics do not suffer, the handling remains natural and there are all the classic expectations, from the double SIM card slot to the micro-SD port, with also a mini-jack port. All that is missing is the waterproofing, often reserved for higher ranges. Screen level, the screen is of reasonable size, with only 5.6 inches diagonal, but its resolution of 1440 by 720 pixels is a little limited for optimal comfort. On the other hand, Amoled technology allows you to enjoy perfect contrast, which compensates for a brightness that is sometimes a little limited. By going through the settings, you get a completely accurate color rendering and realistic colors. Sound level, if the headphone output does not lack power or precision, the stereo image is not balanced and the two channels mix a little. The unique loudspeaker quickly shows its limits. The performance of this Galaxy J6 is quite modest, but in fact its power allows it to meet most uses without noticing any real slowdowns. It is when it comes to playing that you can see some difficulties for this smartphone. In the photo, the Galaxy J6 is clearly at a loss: even in good conditions, the shots lack sharpness, are too smooth and overall unflattering. Competition often does better, and it gets worse in low light, with pervasive noise. For selfies, you have to do with a smoothing often too strong, but the whole thing remains bright, and the video mode is not so bad. If the autonomy of this Galaxy J6 is not the best observed in this price sector, it is still of an excellent level, reaching two days without having to cut back too much on usage. The most economical ones can probably start the morning of the third day without any worries. A question or a problem on the Samsung Galaxy J6? Create a discussion and our team will answer you! Here is a list of comparison tests available between the Samsung Galaxy J6 and others smartphones. There is no opinion yet, be the first to add an opinion on the Samsung Galaxy J6. 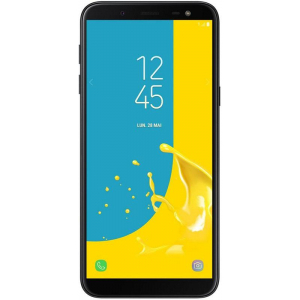 The Samsung Galaxy J6 has several versions, you will find the features of the 64GB / 4GB RAM, Dual SIM version then on the (32GB / 3GB RAM, Dual SIM) alternative version, only with features that are differents form the principal sheet. Information from the technical sheet of the Samsung Galaxy J6 are only indicative, if you notice an error, please inform us with the icon displayed on the right of each specifications.